The most distinctive feature of the American Mulefoot hog is the solid hoof which resembles that of a mule. Pigs with solid hooves (also called syndactylism) have attracted the interest of many writers over the centuries, including Aristotle and Darwin. Yet of all the mulefooted hogs described, the American Mulefoot is the only documented population with a breed standard and a long history of agricultural use. This breed is unique to the United States and is critically rare. Recent events, however, have led to more optimism regarding its survival. The origin of the American Mulefoot breed is not clear, but it has a well-documented history over the last century. F.D. Coburn, in his classic 1916 book Swine in America, notes that the Mulefoot hog was found in Arkansas, Missouri, Iowa, Indiana, across the southwest and in some parts of Mexico. (In southern Missouri and northern Arkansas, Mulefoots were sometimes called "Ozark pigs.") The National Mulefoot Hog Record Association was organized in Indianapolis, Indiana, in January 1908. Two additional registries were also founded. In 1910 there were 235 breeders registered in twenty-two states. Coburn describes Mulefoot hogs as mainly black, with occasional animals having white points; medium flop ears; and a soft hair coat. 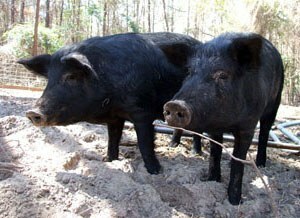 The hogs were of fairly gentle disposition, fattened quite easily, and weighed from 400-600 pounds at two years of age. They were considered the highest quality "ham hogs" and were fed to great weights before slaughter. For some years breeders claimed that Mulefoots were immune to hog cholera. That claim has been disproved, though the breed does seem to posses remarkable hardiness. Mulefoots were taken to Canada between 1900 and 1920 but no attempt was made to establish a herd book and pedigree records were not maintained according to J. W. MacEwan in The Breeds of Farm Livestock in Canada, 1941. Today, the Mulefoot is the rarest of American swine breeds. It has been a conservation priority for American Livestock Breeds Conservancy for over a decade. A very thick file of correspondence attests to continued attempts to locate and evaluate additional populations and establish new breeding groups. A remnant population of the American Mulefoot has been owned by R.M. Holliday of Louisiana, Missouri, for nearly forty years. He remembers from boyhood that his family and others raised these hogs by putting them on islands in the Missouri and Mississippi Rivers to forage during the summer and then rounding them up in the fall for slaughter. This practice was terminated by the Army Corps of Engineers in the 1950s. In 1964 Mr. Holliday gathered together stock from all the known breeders and established his herd. During 1976 he swapped animals with a breeder in North Dakota, which introduced some undesirable traits such as prick ears, wattles and split hooves. Nevertheless, Holliday's strong and consistent production selection has maintained a generally uniform and characteristic herd. After his experience with this "exotic" animal dealer he sold no more stock except those contracted for slaughter. During these years the Mulefoot registries folded and all known copies of the herd books were lost. In the fall of 1993, Mark Fields in cooperation with ALBC, contacted Mr. Holliday in an attempt to purchase a few animals and begin a Mulefoot herd. After several lengthy phone conversations it was agreed that he could go to Holliday's farm to view the herds. Mr. Holliday agreed to sell a small breeding group. After spending time with Mr. Holliday and learning about the recent history of the breed, Mr. Fields decided to reactivate the Mulefoot hog registry. This has been a frustrating task since the registry information was destroyed after the death of the last registry secretary in the 1960s. Mr. Holliday made additional stock available and Fields has assisted the movement of a herd to Iowa, where Kent Whealy of Seed Savers Exchange coordinated their distribution to four breeders. The Mulefoot hog population is classified as Critical by the American Livestock Breeds Conservancy (fewer than 200 in annual registration). However its outlook is improving. It is now being raised by breeders across the state of Missouri and additional stock has recently been sent to Georgia. Anyone interested in raising this breed of swine should contact the American Livestock Breeds Conservancy or the National Mulefoot Hog Association.